The various components of a complex atmospheric model are depicted in figure 7.1.3-1. 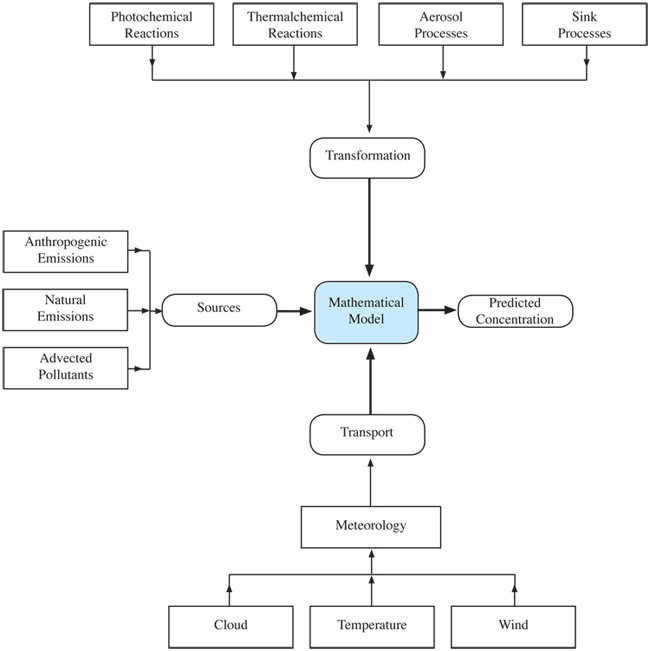 The three basic components are species emissions, transport, and physicochemical transformations in addition, the removal process and meteorology are included in recently developed air quality models. Sources of air pollutants emitted in the particular urban or regional area being modeled as well as those advected by mean winds from outside the area constitute the most important components of the emissions inventory. A comprehensive emissions inventory of anthropogenic and natural sources is thus necessary. A separate chapter will discuss the emissions inventory development process. An urban area typically contains thousands, or even millions, of individual sources that range from small process emission sources, such as incinerators and backyard grills, to large sources, such as fossil-fuel power plants and other industrial facilities. The application of a dispersion model to each of these sources is normally impractical except in cases where the number of sources is small. Even the basic assumption that the contributions of individual sources to the total concentration at a receptor point are additive, which is implied in this type of modeling, is questionable when pollutants from different sources may react with each other. Consequently, emissions from all the small sources in each grid area are often combined together into a larger area source, assuming that emissions are uniform over that particular area. Since vehicular emissions constitute a major portion of urban area sources, their effective height of release is assumed to be the ground level; although, some recent research may suggest otherwise. Large stack emissions are usually treated as point sources whose effective release heights are calculated from the given source and meteorological parameters, using appropriate plume-rise formulas. Dispersion from each of these major point sources is calculated and the resulting concentrations at a receptor point are added to the contribution from area sources. The number of point sources treated this way may vary from tens to thousands, depending on the size and industrial character of the urban area. An accurate emissions inventory, including a knowledge of the diurnal, weekly, and seasonal variations of emissions, is also important for successful urban air quality modeling. Data on emissions are available from many sources including city, county, and state planning and industrial development commissions; chambers of commerce; census bureaus; local and national associations of manufacturers or distributors; individual dealers or distributors of coal, oil, gasoline, and so on; local utility companies; insurance companies; air pollution control agencies; and state transportation departments. The development of a regional inventory is discussed in detail in Chapter 6. There are two transport mechanisms that become important in conducting air quality modeling. One mechanisms is wind transport: an advection process, in which pollutants are carried along with the time-averaged mean wind. The second mechanism is the dispersion mechanism representing transport due to turbulence. Thus, atmospheric motions, for the present discussion, can be separated into two classes: wind and turbulence. With respect to airborne chemical species, the wind is mostly responsible for transport, while turbulence results primarily in mixing of constituents. Within the air-quality community, the two general classes of atmospheric motions (wind and turbulence) are often divided into four scales: large, regional, local and turbulence scales. Advection is the most easily parameterized. The averaging time that determines the mean winds is related to the spatial and temporal scales of the system being modeled. Wind is the deterministic three-dimensional (3-D) motion field with time scales from minutes to days and having spatial scales from kilometers to the planetary scale. Typically, hourly or finer averages of the winds are used. The three-dimensional dynamic meteorology field produced by meteorology forecast models are often used to describe the advection transport. The turbulence characterizes the apparently chaotic nature of fluid flow, which is manifested in the form of highly irregular, almost random, temporal and spatial fluctuations in velocity, temperature and scalar concentrations around their mean values, resulting from instability in a fluid at high Reynolds numbers. Reynolds number refers to the ratio of inertial forces (vs**) to viscous forces (**/L). It is one of the most important dimensionless numbers in fluid dynamics. A low value refers to laminar flow and a high value refers to turbulent flow. It consists of eddy motions having scales from a few millimeters up to perhaps a kilometer, and with time scales from about a second to 20 or 30 min. These parameters have special significance in determining the horizontal and vertical dispersion of pollutants. Turbulent fluxes are difficult to measure, and hence there are uncertainties in the various methods employed by models to describe them. K-theory is typically parameterized as being proportional to the gradient of mean mixing ratios. In this case the eddy diffusivity tensor, K, is determined as a function of atmospheric stability class and mixing height following some parameterizations. K-theory is valid only over short distances, and cannot simulate counter-gradient transport, which can be important in highly convective mixed layers. In air quality models, statistical theories, gradient transport theories and similarity theories are the most widely used descriptions of transport diffusion system. And the parameterization of horizontal and vertical diffusion is the significantly crucial components, usually combined with the empirical dispersion parameters obtained from tracer experiments over cities. 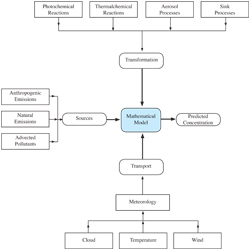 One of the major components of a photochemical model is its description of atmospheric chemistry. There are literally thousands of chemical compounds, undergoing an even larger number of reactions. Chemical mechanisms are used to provide a computationally viable means of representing what is understood about the chemical dynamics of trace compounds in the atmosphere. Studies now can include hundreds of compounds according to the reactivity or molecular type. In addition to homogeneous gas-phase chemistry, heterogeneous chemistry can be important, particularly for acid deposition, ozone and aerosol formation. Aqueous phase chemistry is important to correctly assess sulfate and ozone formation in situations where significant fog and/or clouds are present. In these cases, both the kinetics and mechanisms of the reactions converting primary pollutants into secondary pollutants are employed into the sophisticated chemistry submodels. The importance of the OH radical as well as the development of many specific, sensitive, and accurate techniques for studying reaction kinetics and mechanisms was a very important discovery in the 1970s. At the heart of the atmospheric photochemical oxidant cycle are those reactions involving hydroxyl (OH) and peroxyl (HO2 and RO2) radicals. The hydroxyl radical is the primary oxidant in the troposphere and thus plays a key role in the cycles of many important trace gases emitted into the atmosphere. In addition, these radicals affect the photo stationary balance between NO and NO2 which control the net ozone production in the troposphere. For sulfur and nitrogen oxides and their reaction products, such as sulfates, nitrates, sulfuric and nitric acid, the carbon bond mechanism (CBM) is probably the most widely used mechanism in the early days of modeling, in which the reactions are lumped not in terms of the usual classification of organics, but in terms of the bonding of the atoms in reactants. Such a treatment has been found to oversimplify the influence of NOx and VOCs on SO2 and NO2 oxidation rates, especially in long-range transport and regional acid deposition process. Much more sophisticated chemical kinetic mechanisms have been used in three-dimensional numerical regional models, such as CBM-IV, a hybrid or combination mechanism containing seventy-seven reactions among thirty-six species. These simulate reactions among nitrogen oxides, sulfur oxides, HO radical, hydrogen peroxide, organic peroxides, ozone and numerous other species. The SAPRC-90 is a lumped molecule mechanism where either generalized (lumped) or surrogate species are used to represent organic compounds. Inorganic chemistry in this mechanism is very similar to that included in the CBM-IV but the SAPRC mechanism contains more than three times the number of organic species as the CBM-IV. Like the SAPRC mechanism, the RADM is also a generalized species mechanism but unlike SAPRC, hydrocarbons are represented using lumped species with fixed, rather than user-supplied, parameters. The characteristics of the three mechanisms are in table 7.1.3-2. Due to the limited transport distances and travel times used in the urban air quality models, especially the dispersion models, removal of pollutants by wet deposition and dry deposition are usually ignored. But in long–range transport and regional air quality models, the removal processes can be extremely important. Wet deposition refers to natural processes by which material is scavenged by atmospheric hydrometeors (cloud and fog drops, rains). Wet deposition, resulting from cloud and precipitation scavenging, can be elective in cleansing the atmosphere of pollutants. Rain, fog and cloud droplets can absorb gases, capture or be formed on particles, and promote chemical reactions, and cloud dynamics can be very important on a regional scale. Clouds and precipitation strongly influence tropospheric chemistry in a number of ways: (a) cloud droplets provide the aqueous medium for aqueous-phase chemical reactions; (b) wet removal is the dominant sink for many tropospheric species; (c) vertical motions in convective clouds can rapidly transport species from the boundary layer to the free troposphere; and (d) clouds modify solar radiation fields and photolysis rates. The treatment for wet deposition has two aspects: (a) the specification or description of the cloud and precipitation fields in space and time; and (b) the interactions of trace gases and aerosol particles with clouds and precipitation, including aqueous phase chemical reactions, wet removal, and vertical transport. The simplest treatment of cloud and precipitation processes, treat wet removal as a first-order loss process and ignores other processes. The loss rate, which is called the scavenging coefficient, was determined from empirical or microphysical considerations, and was generally proportional to the precipitation rate. Later comprehensive cloud modules provide relatively detailed treatments of cloud and precipitation processes using the information available in the host code (meteorological information plus the profiles of trace gases and aerosols). The parameterization of the aqueous-phase chemistry (especially the cloud droplet spectra, cloud condensation nuclei size distribution), wet removal, subgrid cloud variability and the vertical transport by convective clouds are needed to be addressed. Dry deposition is, broadly speaking, the transport of gaseous and particulate species from the atmosphere onto surfaces in the absence of precipitation. The factors that govern the dry deposition of a gaseous species or a particle are the level of atmospheric turbulence, the chemical properties of the deposition species, and the nature of the surface itself. The level of turbulence in the atmosphere, especially in the layer nearest the ground, governs the rate at which species are delivered down tothe surface. For gases, solubility and chemical reactivity may affect uptake at the surface. For particles, size, density, and shape may determine whether capture by the surface occurs. The surface itself is a factor in dry deposition. A nonreactive surface may not permit absorption or adsorption of certain gases; a smooth surface may lead to particle bounce-off. Natural surfaces, such as vegetation, whereas highly variable and often difficult to describe theoretically, generally promote dry deposition. Meteorological conditions, including horizontal and vertical wind components, temperature, water vapor mixing ratio, surface pressure, solar radiation, cloud fraction, precipitation, boundary layer height, and turbulence, are known to have direct impact on the simulation. It encompasses many atmospheric processes that control or strongly influence the evolution of emissions, chemical species, aerosols and particulate matter. These processes include horizontal and vertical transport, turbulent mixing, convection and lightning-induced generation of nitrogen oxides (NOx), and both dry and wet deposition to the surface. In addition, the rates at which secondary species and aerosols form and certain chemical reactions take place are affected directly by the relative humidity, solar energy, temperature and the presence of liquid water (clouds). The meteorology models may contain significant uncertainties which adversely affect model simulations. Although additional quantities are required occasionally, the principal meteorological state variables needed for air quality models are horizontal and vertical wind components, temperature, water vapor mixing ratio, cloud fraction and liquid water content, precipitation, solar actinic flux, sea-level pressure, boundary layer depth, turbulence intensity (turbulent kinetic energy or vertical diffusion coefficient ), and surface fluxes for heat, moisture and momentum. In the broader meteorological community, the wind and turbulence motions are often divided into six scales: global, synoptic, mesoalpha, mesobeta, mesogamma and turbulence scales. The relationships between the spatial and temporal ranges of these scales are given in the following section, along with a brief description of their influence on air quality. Many air pollution models interpolate meteorological fields from observations, ignore the affects of clouds, and/or ignore the effects of aerosols. The advantage of using interpolated meteorological fields is that, if sufficient data are available, an interpolated field is more accurate than a prognostic field. The disadvantages are that observed meteorological data are usually available at only a few locations, most of which are near the surface. Thus, data for elevated model layers are scarce or nonexistent. Also, a model that uses a preexisting data base to predict meteorology is not prognostic, since it can simulate only past events.